This morning I woke up keen to get baking again. I can blame the Great British Bake Off, of which I was glued to episode 2 last night while clearing up the kitchen after dinner. I was absolutely blown away by all the fantastic breadmaking going on in the GBBO tent and also enjoyed tweeting about the programme when I should have been loading the dishwasher! I was in a happy mood when the programme finished although I was upset to see Peter go. After his fantastic Union Jack cake which reminded me of a Battenburg, I was surprised to say the least. In that frame of mind I decided to put some towels in the washing machine so they would be done before I went to bed. But disaster then struck! I have been having problems with my washing machine leaking water over the past month or so and it always seems to do it when I have towels in the wash. It is so frustrating as many of you know, we all need our domestic appliances to work properly, especially if you are at work too! Last night though, my machine decided that it was going to churn water out all over the utility room floor, which to me was the last straw. In the end my hubby told me to go to my local electrical shop in Boroughbridge and order another one. To cut a long story short, I was delighted with the service and the guys agreed that they could come and install my new machine and take the old one away this very afternoon! I was so pleased, even though my kids werent! They were gutted they would miss their trip to the cinema in York this afternoon and lunch in Nandos! So, what has all of this got to do with baking? Well, one of the things I do (apart from catching up on all the boring chores) is baking when I know I’ve got to stay in all afternoon. I wanted something quick, yet unusual that the kids would enjoy helping me to make to relieve the holiday boredom. Once again I turned to the new Great British Bake Off recipe book “How To Turn Everyday Bakes Into Showstoppers” and the recipe for Ruby Jacks caught my eye under the biscuit section on page 87. First of all, the name stood out for me. What on earth or indeed who was Ruby Jack? I have been puzzled to find out and I even googled Ruby Jacks but nothing came up only a name of a group, nothing to do with biscuits. I wondered if it was due to the red colour of rubies but scanning down the list of ingredients it sounded like a flapjack mixture with added ground and stem ginger. But, aha! 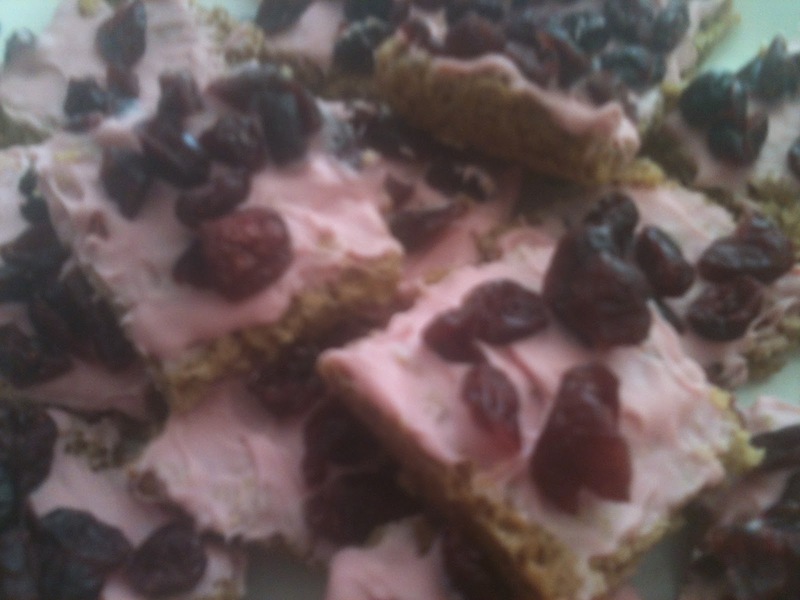 In the bottom right hand corner of the recipe there was a tip suggesting you could decorate the top of the flapjacks with melted white chocolate and dried cranberries and sour cherries, hence I suppose them looking like rubies! I’m still non the wiser though. As soon as I got the ingredients out, my son decided that he would rather play on his XBox and my daughter and her friend were up in her room jamming on their guitars. It looked like it would be me on my own in the kitchen! Even my dog slunk off to his basket to snooze! So, I keenly melted butter, golden syrup, brown sugar in a medium pan, then added a teaspoon of ground ginger and a tablespoon of chopped Opies Stem Ginger to the mixture. Once this was combined I added in porridge oats. The mixture was then placed in a square tin and pressed down with the back of a spoon. There looked like a lot less mixture than I would usually have when I make my flapjacks, these were quite small. After the flapjacks had baked in the oven for 1/2 an hour I took them out of the oven and let them cool in the tin on a wire rack. Meanwhile I searched in my cupboard for some white chocolate, remembered I didn’t have enough spare and settled for some pink chocolate buttons I had bought on holiday on the Isle of Arran at the beginning of June. These only took one minute to melt beautifully in the microwave but were fiddly to spread on the top of the flapjack squares. I found a bag of dried cranberries in the cupboard but I did not use all of them. The recipe did not come with an accompanying picture, which I found frustrating. Sometimes it is useful to know what things look like when you bake them so you can tell whether you’re doing the right thing. I had to guess! Here are the finished Ruby Jacks piled up on a plate. I personally wouldn’t have put so many cranberries on the top of the flapjacks and could have piped the chocolate on in a drizzle to make it look neater but I was trying to follow the recipe!